Check for Special Offers in Your Area! FREE HD** Channels, on demand access and 3D movies. Take TV on-the-go with mobile devices. Great for surfing, e-mailing, downloading music, online gaming, and more! Wouldn't it be great if you could save money on the home services you want and need the most? Well now you can, thanks to TV, Internet and phone deals at BuyCharter.com! 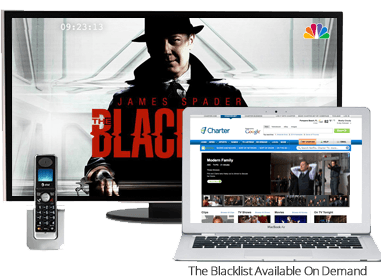 Charter TV Brings You More Savings, and More Value! 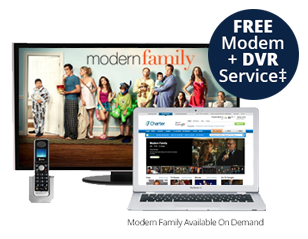 Don’t Miss Out on Charter TV®, Internet and Phone Offers! Choosing Charter TV service will expand your viewing capacity as the sheer volume of selections is unlike any other provider. Charter TV offers over 200 channels including FREE HD, plus all of your local channels as well as a wide variety of movies, sports, news and children's programming. With On Demand you'll gain access to over 10,000 options including an endless selection of both new and classic movies, concerts, comedy specials, exercise programs and much more. A subscription to premiums channels upgrades your plan so you can watch all of your favorites on HBO®, Cinemax®, Showtime®, TMC®, Encore®, Starz® and EPIX®! Order cable TV service today from Buy Charter.com, where you'll find the best price on Charter TV as a standalone digital television service or as part of a bundle. Charter Internet lets you race around the Web at speeds that make surfing, shopping and gaming a breeze. Now you can chat with your friends in Miami, email your friends in Milan, and shop online at Beverly Hills boutiques, all at the same time! High Speed Internet service from Charter truly brings the world to your fingertips, and lets you enjoy it in a way that just isn't possible with a dial-up connection. Charter Internet features up to ten e-mail addresses so every member of your family is covered, as well as a free security software suite for your peace of mind. Order super fast Internet today at BuyCharter.com. Our specials mean you'll pay the lowest price available for Internet as a standalone service or as part of the Charter Triple Play Bundle. Switch and receive a much clearer digital connection at a substantial savings with Charter Phone while keeping your current phone and phone number! Just imagine being able to call your friends and family anywhere in the United States, Canada and Puerto Rico for one low monthly price! That is no longer a daydream with Charter Phone. With digital phone service, you'll also be able to enjoy all of the calling features that came with your previous land line phone, like Call Waiting, Caller ID, Call Screening, Call Forwarding and more. Order phone service today at Buy Charter.com, where you'll save big whether you prefer it as a standalone service or as part of a Charter triple play bundle. †Internet speeds may vary by location. **HD channels may vary, check your local listings for specific channels for your home. Bundle price is $89.97/mo. Yr 1 & $109.97/mo. Yr 2; standard rates apply after 2 years. Qualifying bundle includes Charter Spectrum TV® Select, Charter Spectrum Internet® with speeds starting at 60 Mbps and Charter Spectrum Voice®. TV equipment required & is extra; Charter Spectrum modem is required & included in price; Phone taxes, fees, & surcharges are included in price; other equipment, install, taxes, fees & surcharges may apply. Bundle price is $109.97/mo. Yr 1 & $129.97/mo. Yr 2; standard rates apply after 2 years. Qualifying bundle includes Charter Spectrum TV® Silver, Charter Spectrum Internet® with speeds starting at 60 Mbps and Charter Spectrum Voice®. TV equipment required & is extra; Charter Internet modem is required & included in price; Phone taxes, fees, & surcharges are included in price; other equipment, install, taxes, fees & surcharges may apply. Bundle price is $49.98/mo. Yr 1 & $64.98/mo. Yr 2; standard rates apply after 2 years. Qualifying bundle includes Charter Spectrum Internet® with speeds starting at 60 Mbps & Charter Spectrum Voice®. Charter Internet modem is required & included in price; other equipment, install, taxes, fees & surcharges may apply. To qualify for contract buyout program order and install a qualifying new customer Triple Play Promotion or limited Double Play promotion (Note offers not available in all areas). A copy of the final bill from previous provider with early termination fees clearly marked and completed in addition to the ‘Charter Contract Buyout Form’ are required to qualify for the contact buyout program. Upon receipt of the forms and verification of eligibility, a check in the amount equal to the early termination fee charged by your previous provider on your final bill (not to exceed $200), will be mailed to your Charter service address. Contract buyout forms must be received by Charter within 60 days of installation of the Charter Triple Play or 2 weeks from the date listed on the competitor's final bill statement, whichever is later. Contract Buyout form can be found at https://www.charter.com/mycheck. ©2017 Charter Communications, Inc. Offers are valid for a limited time only, to qualifying residential customers who have not subscribed to applicable services within the previous 30 days and have no outstanding obligation to Charter. Standard rates apply after promotion. TV equipment required & is extra; Charter Internet modem is required & included in price; Phone taxes, fees, & surcharges are included in price; other equipment, install, taxes, fees & surcharges may apply. Credit approval, prepayment or major credit card may be required. Services are subject to all applicable service terms & conditions, which are subject to change. Trademarks belong to their respective owners. Services not available in all areas. Restrictions apply. Requires purchase of standard triple-play package. Cannot be combined with any single or double-play upgrade offers.